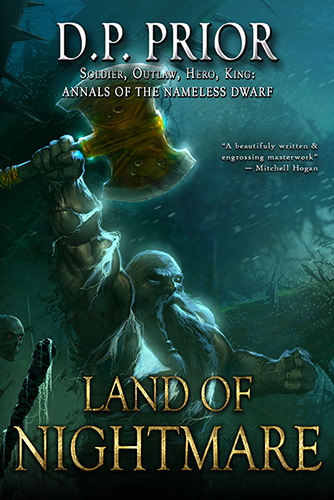 With Nils Fargin, the son of a Jeridium guild lord as his guide, Nameless pursues the survivors among the dwarves, hoping to convince them that the curse of the Black Axe has been lifted from him and they are safe to return home. The trail leads to the town of Malfen—a nest of cutthroats and the gateway to Cerreth, the Land of Nightmare, which would be suicide for the dwarves to enter. Nameless and Nils join forces with a shapeshifting assassin and a sorcerer under the sway of a dubious magical grimoire for the hazardous journey into Cerreth. It soon becomes apparent their new companions have agendas of their own. With threats from within and horror on every side, Nameless knows that time is running out for his people. The only surprise is that they have lasted so long. But new hope awaits him in a city beneath the waves—if he can first survive the unstoppable evil that destroyed the dwarf lords of old.